There is a long, well known boulevard in Paris called le Boulevard Pereire (after the name of the Pereire brothers two businessmen of Portuguese origin - their actual name was Pereira - who were very famous and influencial around 1850). Among many things in Paris, they built several train lines and one of each would go from les Batignolles area to the Porte d'Auteuil, partly along this boulevard. Since then, it has been covered (and obviously turned into gardens) but the train tracks are still there underneath; they are now used by the RER, our suburban metro. 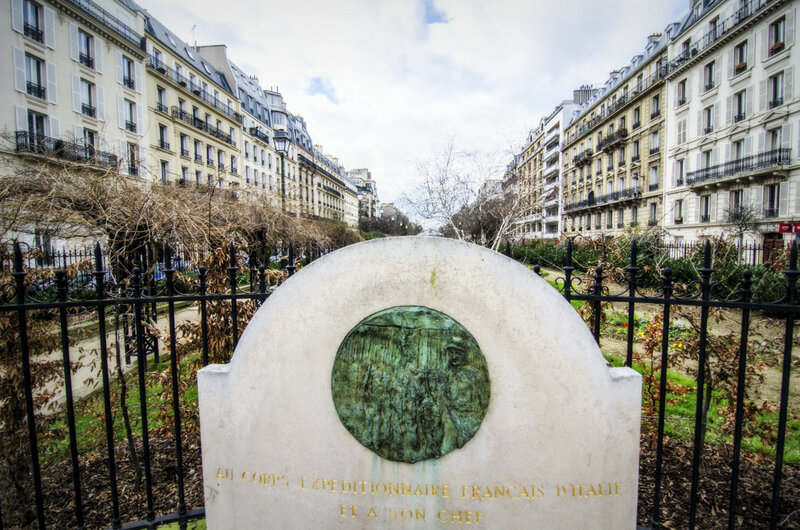 I just discovered, thanks to ParisDailyPhoto, that I have never been to the 17th arr. NEVER. So of course the Boulevard Pereire is going on my list of Must See for my next visit. This looks like one fabulous garden and I need to see this place if I want to be a connoisseur of Paris. And doesn't everyone want to be a connoisseur of Paris? Fabulous, I would not say so, but it's worth A visit. They are the same brothers who develop La Plaine Monceau aren't they? we are grateful to see all those hôtels particuliers around the parc including the Musée Nissim de Camondo. Yes they are. They did a lof of things under the "reign" of Haussmann. I wondered about this stretch of quiet beauty when I visited on a Sunday - (actually went there twice) - the 2nd time with playing children and their parents.... lovely news - didn't know those fascinating details. Merci Eric! Very nice pedestrian green boulevard. Very civilized. I did read that didn't I? The 2013 PDP Picnic will be on May 5. Yay!! Everybody buy your tickets! Let's go! Is Rose in England or in South America? I believe Drummond and Mai will be there. Anissa? Anne? GG? Guille and Michael? Round 'em up, folks! It also will a party for another reason...! LOL Yes you read it well. I need to announce it on the front page.